Saffron Caravan - Genesis at the Crossroads’ professional world music ensemble and their signature work in arts-diplomacy connecting cultures. 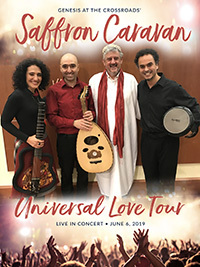 The group's repertoire spans seven languages and explores the roots of blues and jazz infused with Afro-Caribbean, Southeast Asian and Middle Eastern melodies and rhythms, uniting artists from Iran, Afghanistan, Cuba, Morocco, India, Israel, Brazil, Venezuela and the United States. Saffron Caravan offers music education, roundtables on the role of arts in conflict transformation, cultural exchanges and community partnerships as key components of their arts-based humanitarian work. This particular performance, as part of their world tour, features their inter-disciplinary work with refugee dancers from Myanmar and the DR Congo.